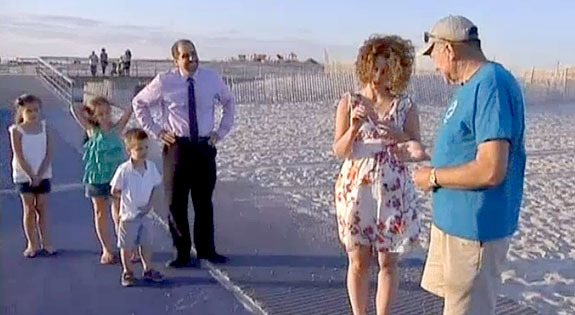 Retired firefighter and metal-detector enthusiast Mike Cogan made the “find of a lifetime” when he scooped up two platinum-and-diamond rings from the beach at Robert Moses State Park on Long Island on August 6. The first was a three-stone engagement ring with a 1.3-carat round center diamond, and the other was a wedding band adorned with small round diamonds all the way around. A local jeweler told Cogan that the engagement ring alone was worth more than $13,000. But, instead of keeping the bounty for himself, he decided to do the right thing and attempt to find the owner. 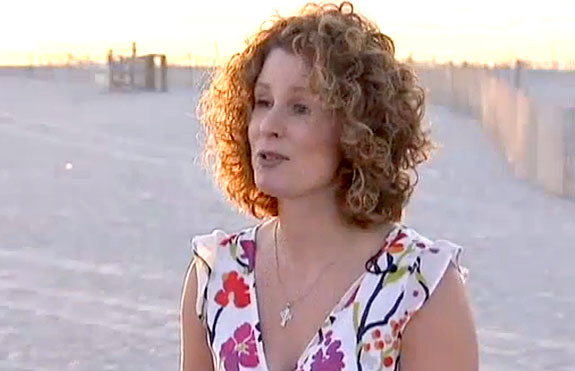 Two days earlier, mom-of-three Erin Carrozzo was enjoying an outing with her little ones on the same beach when she removed her rings to apply sunscreen. She got distracted when she had to run down her three-year-old boy, and didn’t realize her rings were missing until they all got back to the car later in the day. Carrozzo went back to the beach to search the sand, but her rings were nowhere to be found. 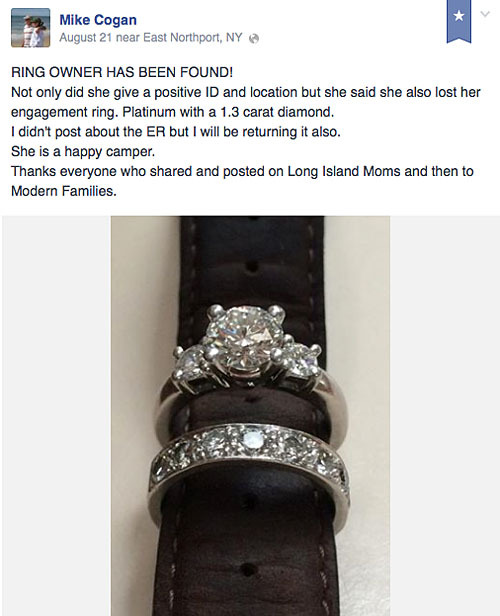 The 41-year-old mom reported the rings lost to beach authorities and cried on the ride home to Flushing, NY. "I felt like all the blood drained out of my head," she told Newsday. "That's the only way I could describe it." 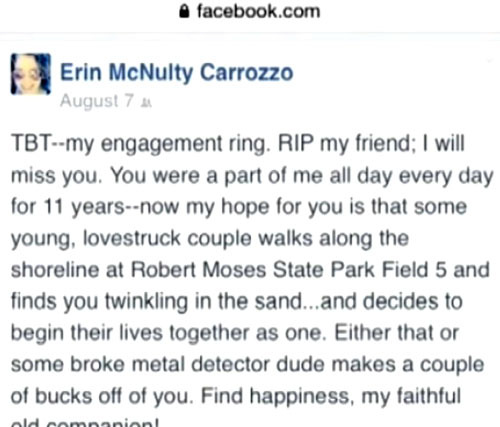 On August 7, accepting harsh reality that she would probably never see her rings again, Carrozzo used Facebook to express her anguish. She bid farewell to her engagement ring. "You were a part of me all day every day for 11 years," she wrote, adding that she hoped that the ring would eventually be found by some lovestruck couple who could use it to begin their lives together. She also made an ironic comment about "some broke metal detector dude" making a "couple of bucks off of you." Fortunately, her description did not define the fine character of Mr. Cogan. 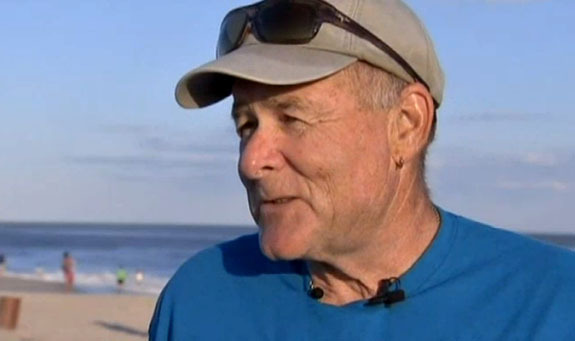 The 66-year-old Cogan told NBC 4 New York that he noticed immediately how precious the rings were. “This isn't a kid's ring,” he said. “This is platinum and these have to be real diamonds. I knew how empty she had to feel. I don't want anybody to feel like that, so I started my search." His first strategy was to create a lost-and-found item on Craigslist. When that didn’t work, the resident of East Northport, NY, turned to Facebook. Cogan’s initial post was shared more than 19,000 times, especially among the Long Island-based mommy groups. 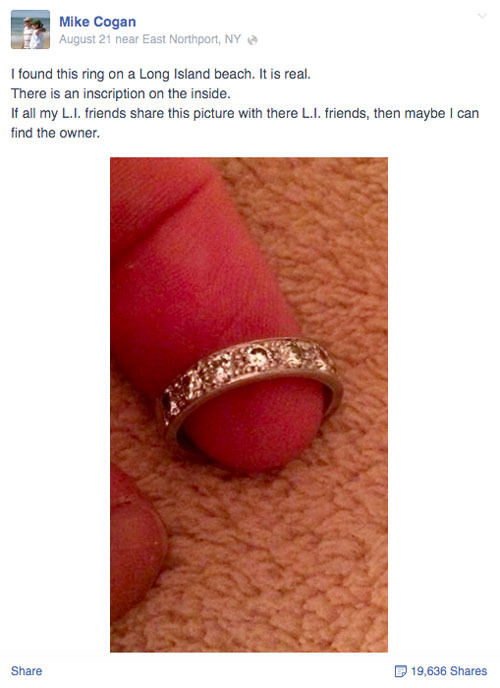 Later that same day, a Facebook friend alerted Carrozzo to a photo of the wedding band. "I was like, oh my God, that does look like my ring!" Carrozzo told Newsday. Carrozzo phoned Cogan and explained that she had lost two rings, but was happy to get the band back. Then Cogan revealed he had found the engagement ring, too. On Thursday, August 28, Cogan and Carrozzo got to meet in person at the same beach where the rings were lost. With an NBC television crew on hand, Cogan returned the rings to their rightful owner. The retired firefighter asked Carrozzo to close her eyes as he placed both the engagement ring and the wedding band in her hands. “Doesn’t that feel good?” he asked. 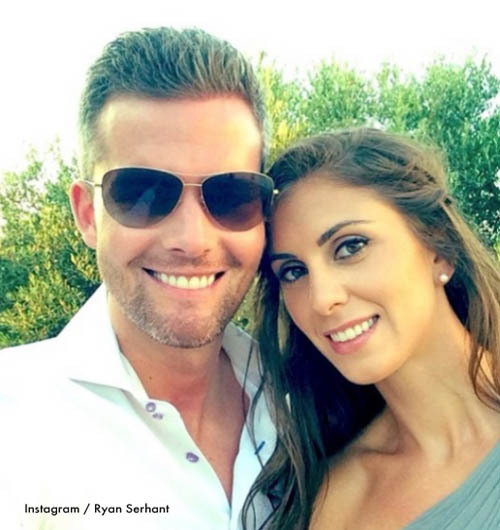 "This man hit the jackpot, and he chose to hunt me down," she told Newsday. "And I can't thank him enough." 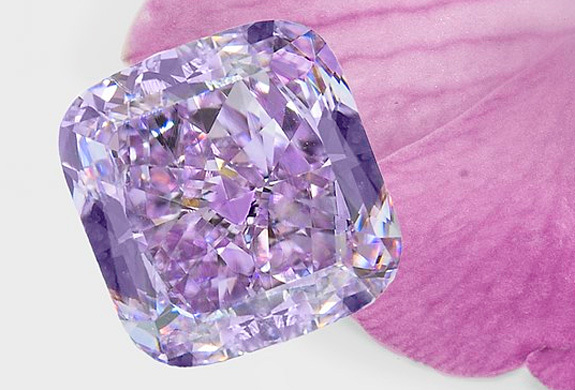 Dubbed the “Purple Orchid,” the 3.37-carat fancy intense pinkish-purple cushion-cut gem in your gaze is an extraordinarily rare natural diamond. Purple diamonds of this clarity, size and color intensity rarely appear in nature. They come along once in a generation and demand the highest premiums. This stone is valued at $4 million, or about $1.18 million per carat. 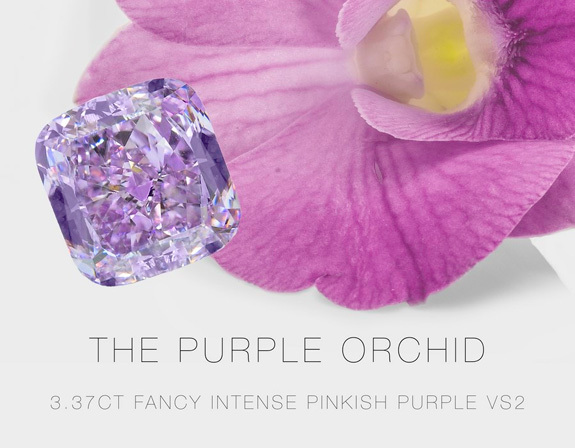 Israeli diamond company Leibish & Co. will introduce the Purple Orchid to the world during the September Hong Kong Jewellery & Gem Fair. The gem, which has a clarity rating of VS2, was cut from a 4-plus-carat rough diamond sourced from the Kimberley Mine in South Africa. 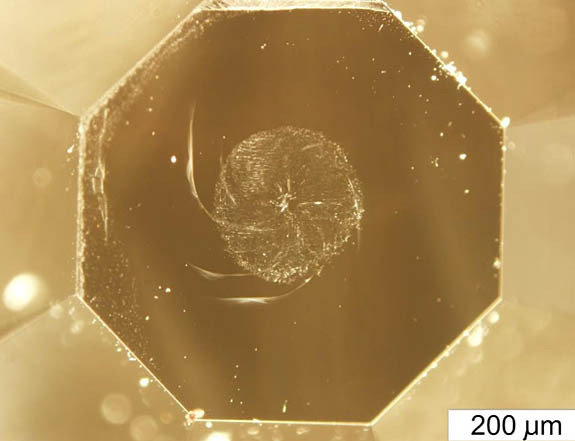 The diamond was carefully polished over a three-month period. Leibish reports that purple diamonds can be found in only three locations worldwide — South Africa, Russia and Brazil. While Russia’s purple diamonds have overtones of blue and Brazil’s purple diamonds tend to have a hint of orange, the purples and intense pinkish purples from South Africa display the absolute best brilliance and purple sparkle, according to Leibish. What makes purple diamonds purple is still a scientific mystery. It's been established that a yellow diamond gets its dazzling color from minute traces of nitrogen in the diamond’s chemical composition and a blue diamond gets its color from boron. 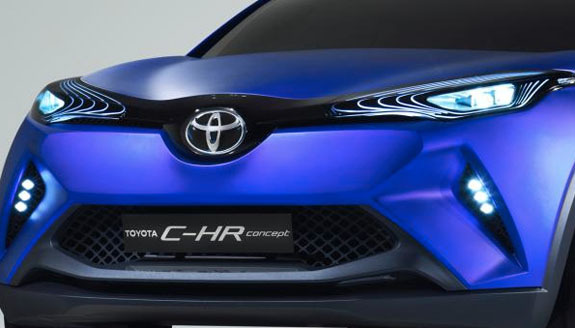 When it comes to purple, scientists suspect hydrogen as the stray element, but they're not so sure. “The cause of purple in diamonds remains a mystery, which only adds to the glamour and attractiveness of diamonds like these,” said Leibish Polnauer, the president of Leibish & Co. 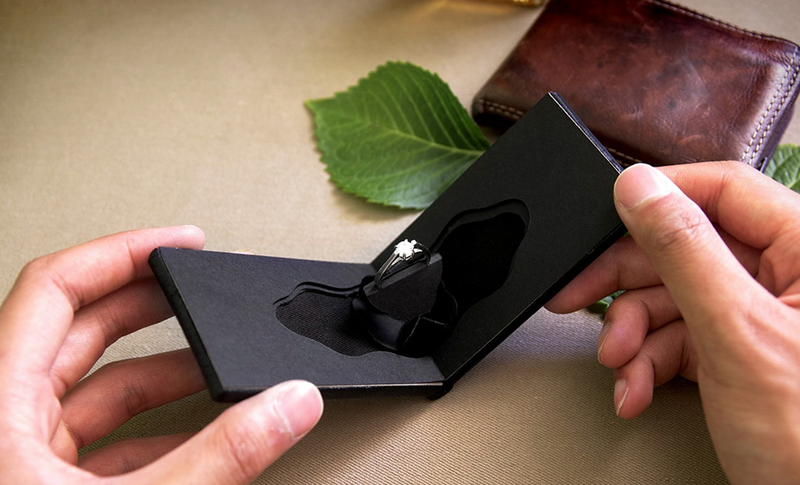 Slowly open the super-slim “Clifton” ring box by Canadian packaging designer Andrew Zo and watch the engagement ring pirouette like a ballet dancer. Just one centimeter thick and smaller than a wallet, the “Clifton” leather-bound box is cleverly designed with a special ring-shaped inset that protects the jewelry when the box is closed and an origami-inspired holder that twirls the ring a quarter turn when the box is opened. 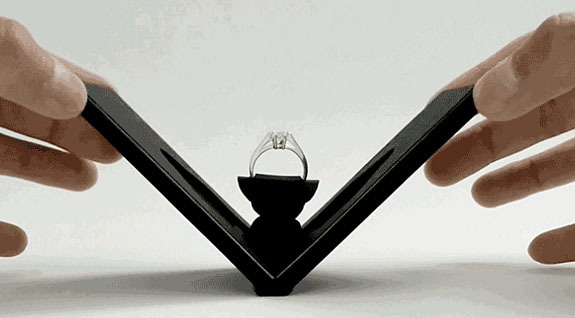 The bulbous shape of a traditional ring box has challenged men for generations. 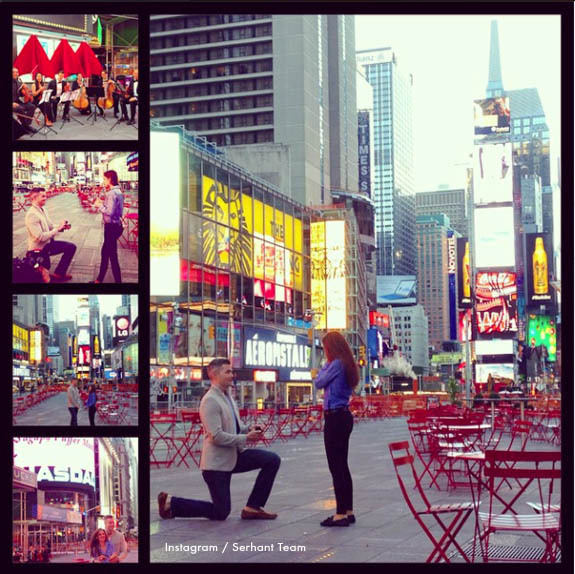 When planning to pop the question, there was no hiding the telltale ring-box bulge in their shirt or pants pocket. 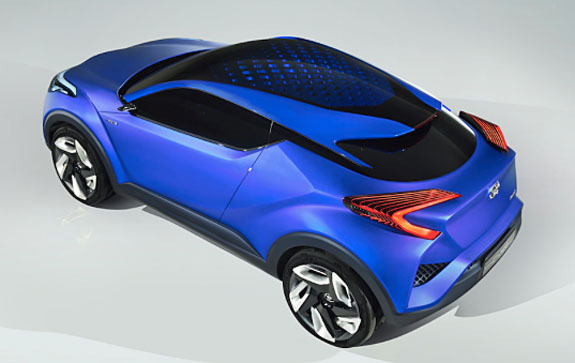 Zo decided to solve the problem as a student of Emily Carr University, an art and design school in Vancouver, B.C. Not only was Zo able to come up with a way to make the box much thinner, but he was also able to translate his love of origami into an animated display. While his student project earned accolades, the product was not commercially viable. Zo has worked for the past three years to refine the “Clifton” and prepare it for market. Starting at $90, Zo’s ring box might seem pricey to some. He reasons, however, that for anyone spending $5,000, $10,000 or more on an engagement ring, the additional cost is negligible — and worth it. The Vancouver-based Zo currently sells the “Clifton” on his website, but it seems as if all his recent publicity has compromised his site’s ability to process online orders. A “thank you” message at clifton.andrewzo.com explains that the site is experiencing overwhelming demand and that online ordering capabilities will return in October. For now, purchase inquiries should be directed to Zo at this email address: hello@andrewzo.com. Welcome to Music Friday when we love to revitalize long-forgotten tunes with jewelry, gemstones or precious metals in the lyrics or title. In Elvis Costello’s “The Element Within Her,” the singer-songwriter-poet uses precious gems to describe a girl who is radiant on the inside and out. 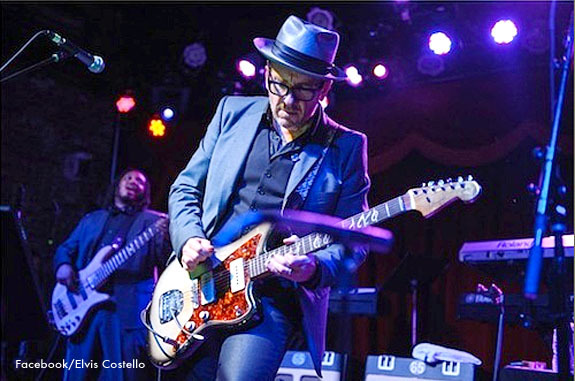 Elvis Costello and the Attractions released “The Element Within Her” in 1983 as the fourth track of their album, Punch the Clock. The album met with moderate success as it reached #24 on the U.S. Billboard Pop Albums chart. Even though “The Element Within Her” never charted as a single, the song has been included on many of Costello’s set lists. According to a Costello fan site, “Element” was first performed live in London in 1983, and the last time fans enjoyed it live was in Chicago in 2011. Born in London in 1954, Declan Patrick Aloysius MacManus became Elvis Costello when his manager, Jake Riviera, suggested that he merge Elvis Presley’s first name with Costello, which was his dad’s stage name. Costello is credited with being a pioneer of the British punk and new wave movements in the mid-to-late 1970s. Costello and The Attractions were inducted into the Rock and Roll Hall of Fame in 2003. Rolling Stone magazine ranked Costello #80 on its list of the 100 Greatest Artists of All Time. We hope you enjoy Costello’s performance of “The Element Within Her.” The video and lyrics are below. Please note that the length of the song is actually 2:50, not 12:25 as seen on the video's timeline. Written and performed by Elvis Costello. 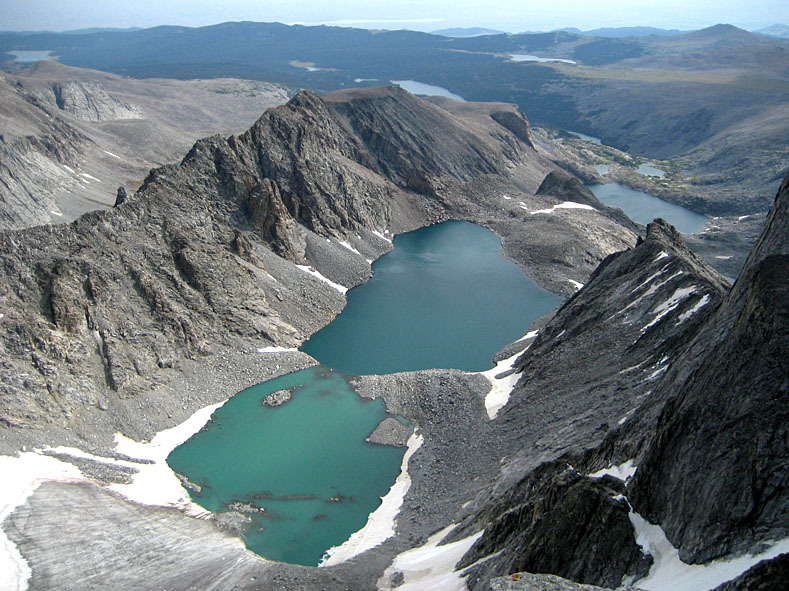 What was supposed to be a romantic “engagement weekend” adventure to the top of Wyoming’s Black Tooth Mountain turned into a chilling six-day test of survival for a couple who got stranded on a cliff at 12,500 feet. To keep warm, the couple was forced to use the engagement ring box as kindling. 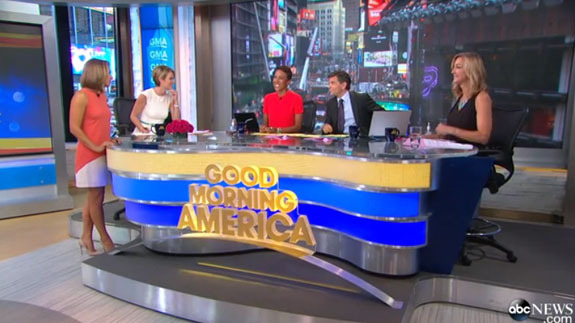 The couple's horrifying ordeal and eventual rescue was the subject of featured segment on Friday's edition of ABC's Good Morning America. 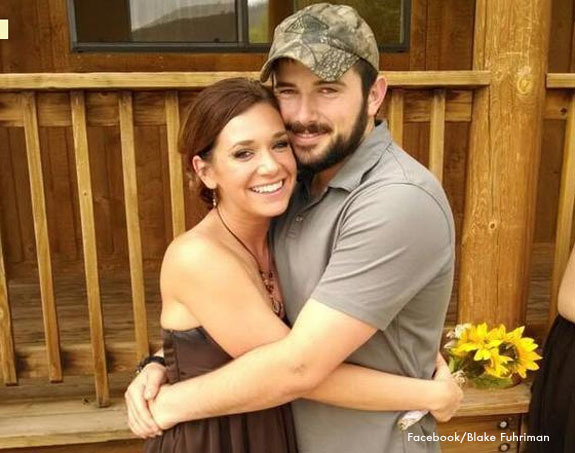 Blake Fuhriman, a 23-year-old former Army Ranger from Sheridan, Wyoming, thought it would be a great idea to take his girlfriend, Alissa DeVille, 26, on a hike to the top of Black Tooth Mountain in Bighorn National Forest, where he would pull out an engagement ring and surprise the love of his life with an unforgettable marriage proposal from the highest of heights. 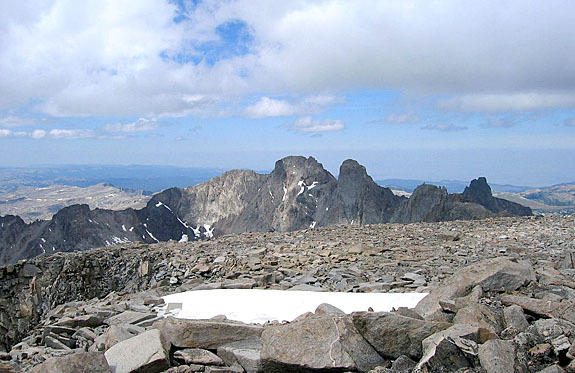 Black Tooth Mountain as viewed from the summit of Cloud Peak. Image: Wikimedia Commons. 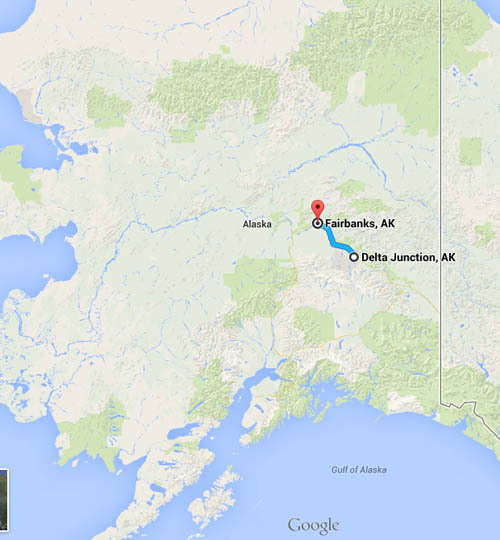 At 9 a.m. on Friday, August 29, the couple set out on a climb that was scheduled to take just a day. All they carried were their daypacks and the clothes on their backs. Fuhriman told ABC News that as they moved up the mountain and the terrain got more and more treacherous it became clear they could not return via the route they came. Fuhriman, who honed his survival skills while serving in the U.S. Army, was betting that once they hit the summit, they could choose a safer path for their descent. Instead of finding the summit, however, the couple ended up stranded on a narrow patch of land near a cliff. Even though they were forced to spend an unintended frigid night on the ledge, Fuhriman still went through with his marriage proposal. 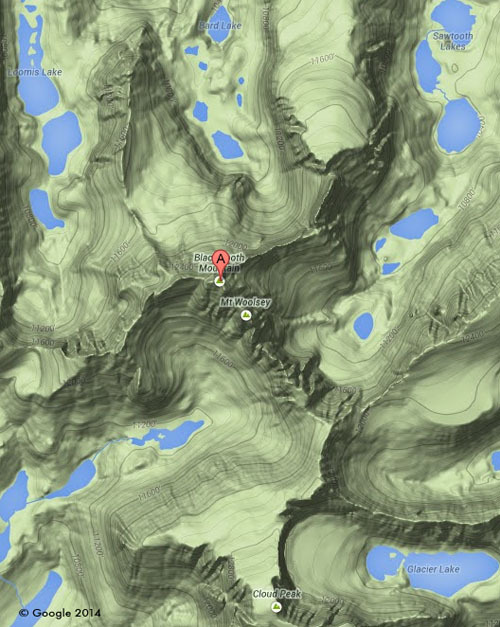 On Saturday, the couple attempted to make their descent, but the terrain proved too dangerous. On their way back up, DeVille twisted her ankle, forcing them to stay put and hope for a rescue. The couple was unable to call for help because of poor cell service, at first, and then a depleted phone battery. With freezing evening temperatures and no food or water, Fuhriman and DeVille used the few resources they had available to survive. They melted snow for water and scavenged for kindling. Among the things they burned were the cargo pockets off Furhriman’s pants and the empty box that held DeVille’s engagement ring. By Monday, search-and-rescue officials, along with the couple’s friends and relatives, had been alerted to the emergency and set out to find them. Fuhriman said that he saw search planes going overhead 10 to 15 times, but he and his fiancée were not seen. Fuhriman told ABC News that, by Wednesday, the couple was hallucinating and suffering from the effects of hypothermia. Now six days into the ordeal and fearing they wouldn’t be able to survive another night, the couple decided that Fuhriman would make the descent on his own, while leaving the injured DeVille behind. Three hours later, exhausted and dehydrated, Fuhriman had found a base camp manned by the Johnson County Sheriff’s search team, which included Civil Air Patrol, the Army National Guard, and volunteers from Johnson, Washakie and Sheridan counties. DeVille was soon rescued and taken to a local hospital to treat her injuries. 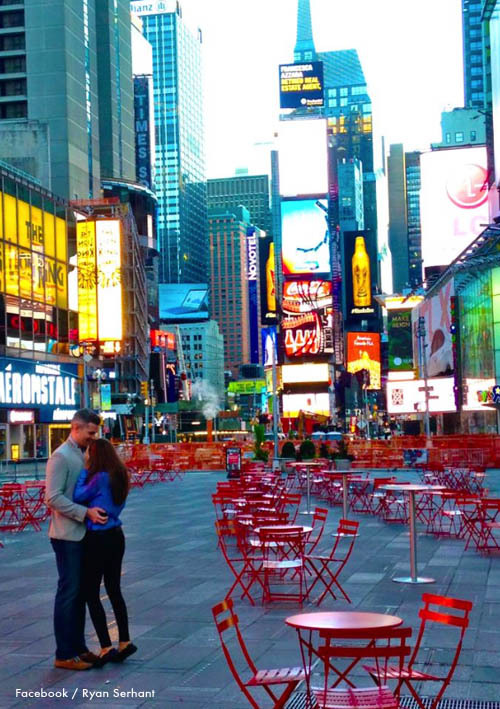 The couple now shares an engagement proposal story that will be one for the ages. 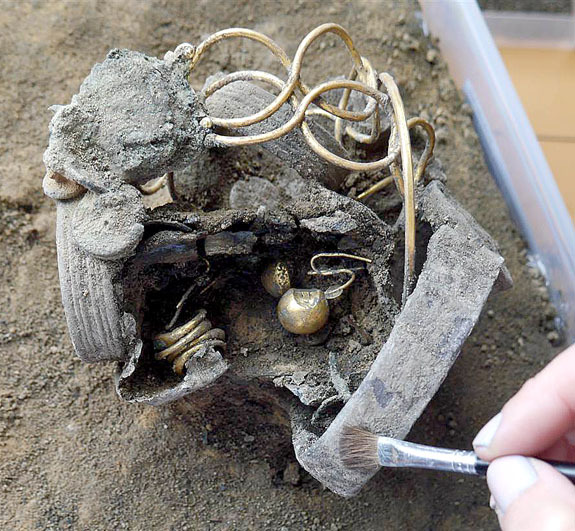 A cache of blingy gold and silver jewelry hidden by a wealthy Roman woman nearly two millennia ago was unearthed recently during a department store site excavation in the historic British town of Colchester. 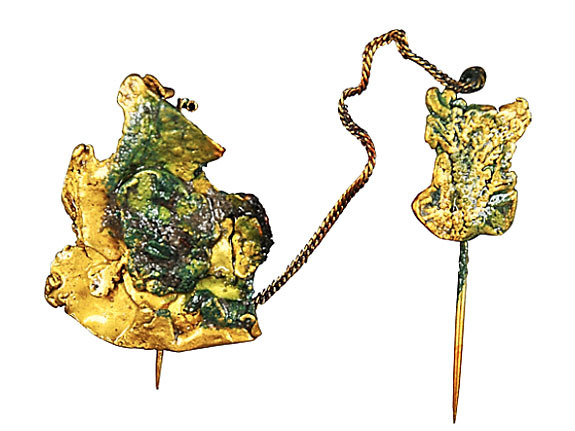 The treasure, which has been dated to the year 61AD, provides examples of what the best-dressed women of the day were wearing. 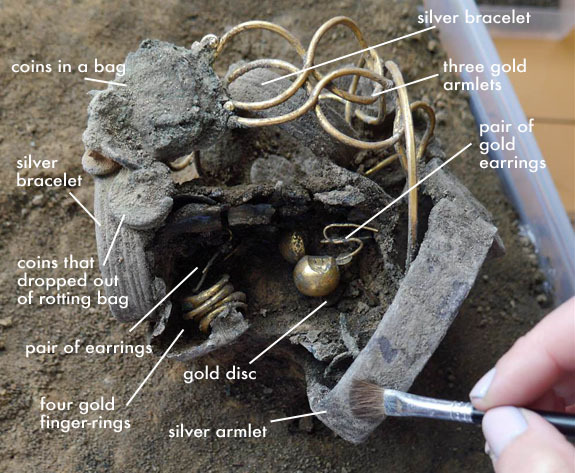 Among the items were three gold armlets, a silver armlet, silver chain necklace, two silver bracelets, four gold rings and two sets of gold earrings. Also found was a bag of Roman coins and a small jewelry box. 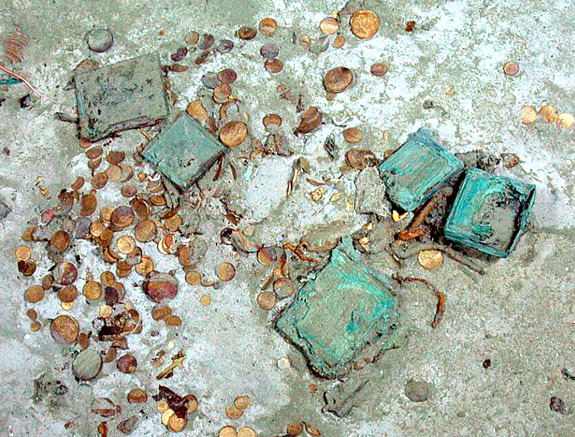 Experts from the Colchester Archaeological Trust surmised that the wealthy Roman woman hastily buried her valuables in the floor of her home due to a feared invasion by native Britons. The military campaign, which ultimately failed to wrest control from the Romans, was to be known as the Boudican Revolt. Physical evidence, including scorched food items and broken human bones, tells a harrowing story of a home that was burnt to the ground during the violent rebellion. 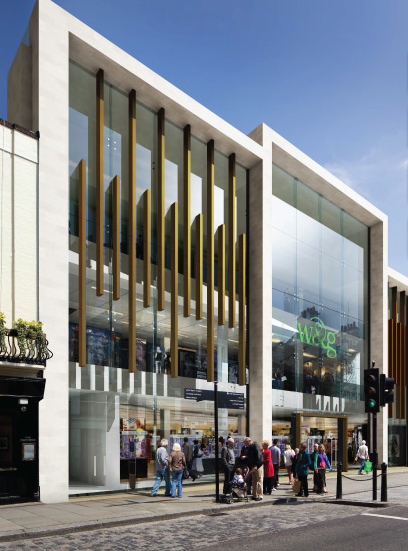 The surprising find, which the Colchester Archaeological Trust is calling the finest discovery of Roman jewelry in British history, would have been lost forever had it not been for excavation work related to the $48 million expansion of the upscale Colchester department store, Williams & Griffin. The store offers everything from furniture to fashion (Yes, they sell fine jewelry) and is located about 65 miles northeast of London. 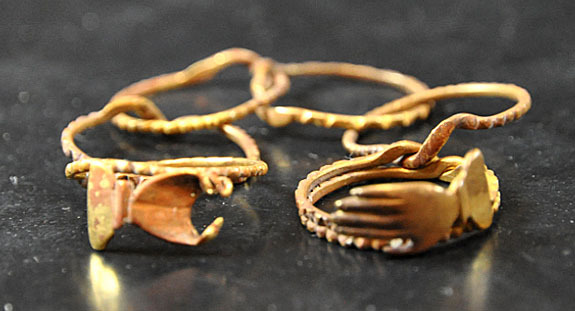 “We have been working on the site for six months, and this remarkable Roman jewelry collection was discovered on the third to last day of our dig,” Colchester Archaeological Trust director Philip Crummy told the East Anglian Daily Times. According to NBC News, the department store’s owner, Fenwick Ltd., is planning to donate the Roman hoard (now called the “Fenwick Treasure”) to the local Colchester Castle Museum. Colchester has the distinction of being the oldest town in Britain. The new Apple Watch can manage your fitness, monitor your heartbeat, plan your diet, check your stocks, connect with social media, give you directions, unlock the door of your hotel room — and, oh yes, tell you the time. Introduced yesterday by Apple CEO Tim Cook, the Apple Watch represents the next “product revolution” at Apple and is seen as a game-changer in the burgeoning wearable-tech category. 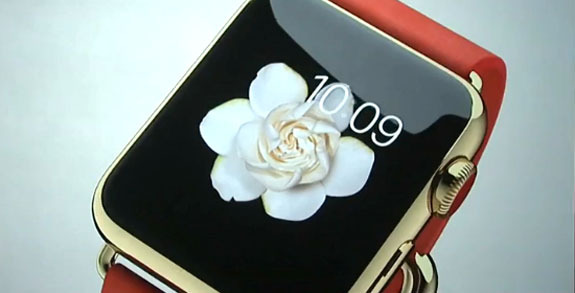 The high-end version, called “Apple Watch Edition,” is available in 18-karat yellow or rose gold and features a sapphire crystal, ceramic back, leather band and magnetic clips. 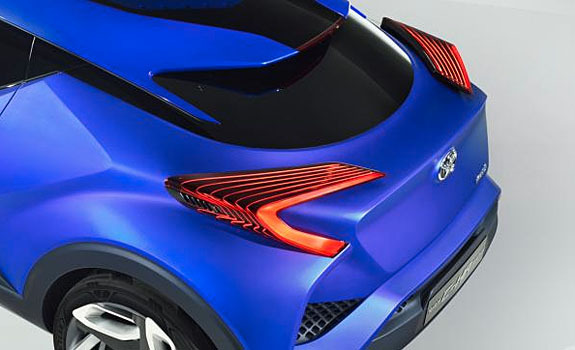 It also comes in a standard model and more rugged sports model, with options for bands made of colorful rubber or stainless steel. 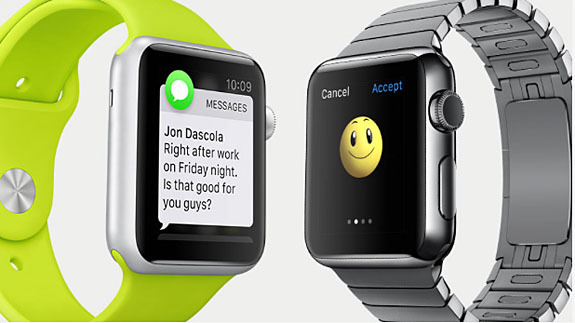 The watches are available in two face sizes, 38mm and 42mm. Because the face is a teeny Retina display, the user can choose on the fly between multiple watch faces, including a throwback Mickey Mouse motif or a moon-phase astronomy-themed version. Packed inside the watch case is a heart-rate sensor, accelerometer, gyroscope, photosensor, speaker and vibrating mechanism that cues the user to make a turn when using a map app. 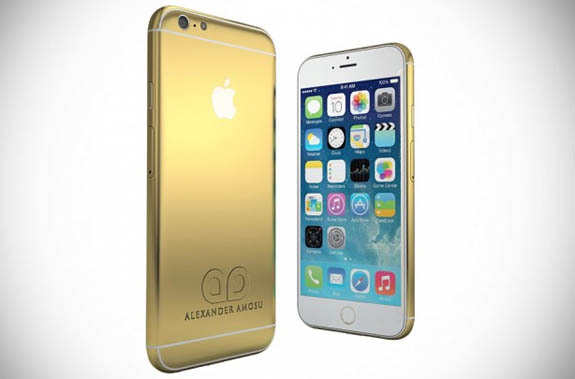 Already on the way are third-party apps from companies such as Nike, BMW, Pinterest, Facebook and others. 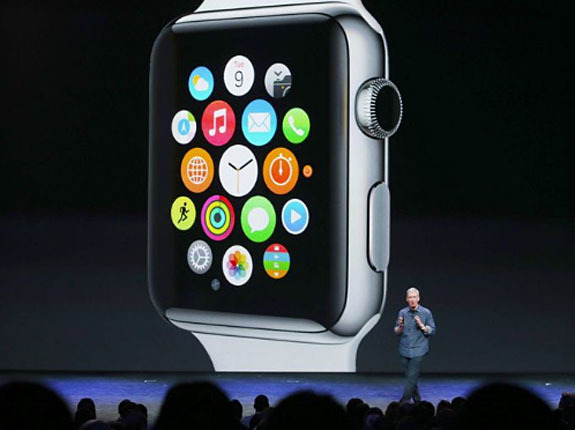 Although the watch face can act as a touch-screen, the Apple Watch includes a primary interface called a “digital crown.” Resembling the crown of a conventional watch, the digital version can be manipulated to control zoom and scrolling, and to make selections from a cloud of “bubble” apps on the screen. 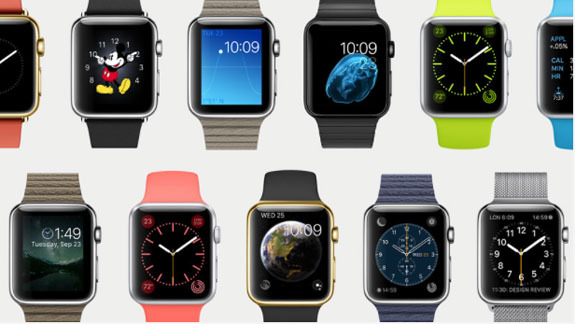 The Apple Watch, which has a starting price of $349 and will be available in early 2015, cannot stand alone. 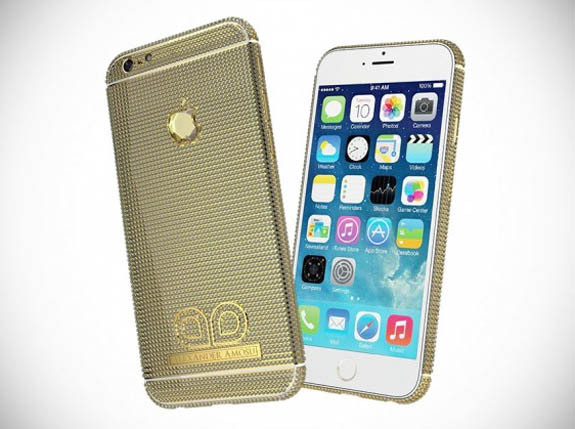 It must be paired with an iPhone 5 or higher. Because it can leverage the power of the iPhone, the Apple Watch can commandeer such functions as GPS, Wi-Fi and the Siri digital assistant. 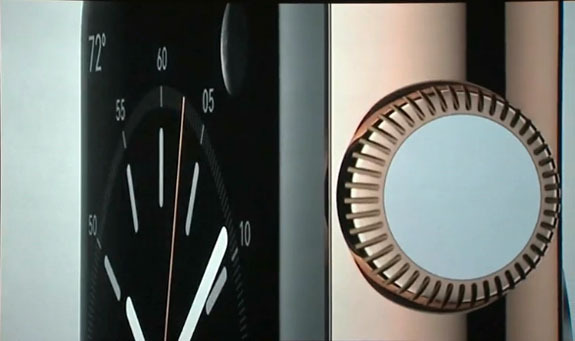 The Apple Watch features an innovative wireless magnetic charger that clips to the back of the device. 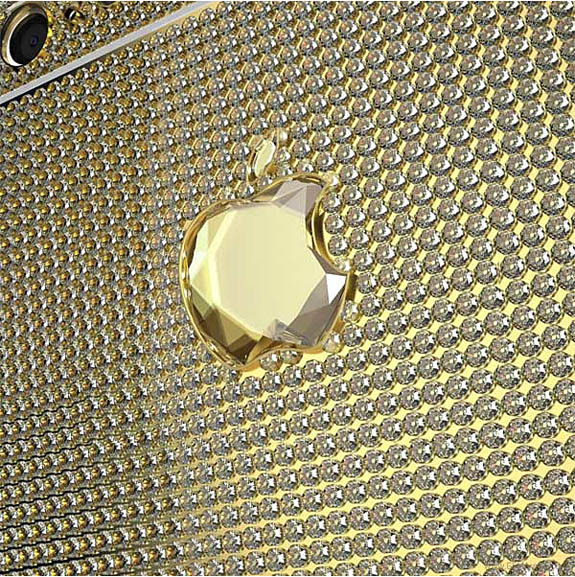 Pricing for the 18-karat gold Apple Watch Edition has yet to be disclosed. Twenty-five percent of American adults plan to buy a so-called "wearable" tech device in the next year, and 42% are interested in a wrist-based device, according Forrester, an independent technology and market research company. The famed Cullinan mine in South Africa continues to produce a parade of mind-numbing rough diamonds, including this 232-carat D-color stunner that’s the size of a strawberry and has the potential to sell in the range of $20 million. 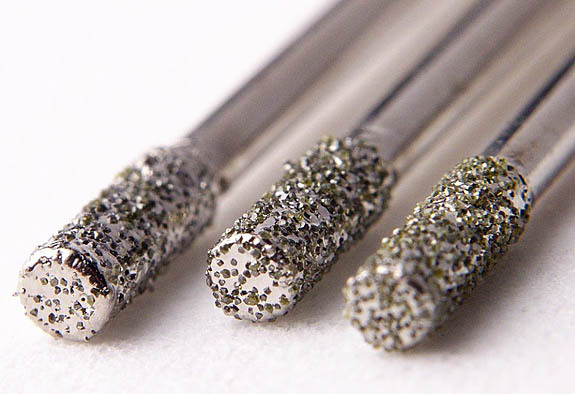 Petra Diamonds, which owns and operates the Cullinan Mine, reported that the colorless diamond is rated Type II, which means it has no measurable nitrogen impurities. The mining company expects to sell the rough diamond sometime between October and December. 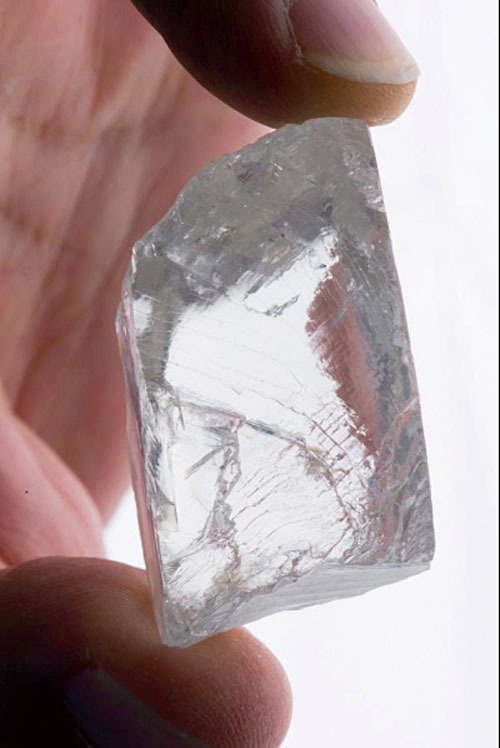 Petra’s mammoth find, which looks like a remnant of an ice sculpture, is the largest colorless diamond to come from the Cullinan mine since 2009, when it yielded the 507-carat Cullinan Heritage. The London-based Petra Diamonds has had a run of incredibly good fortune in 2014. 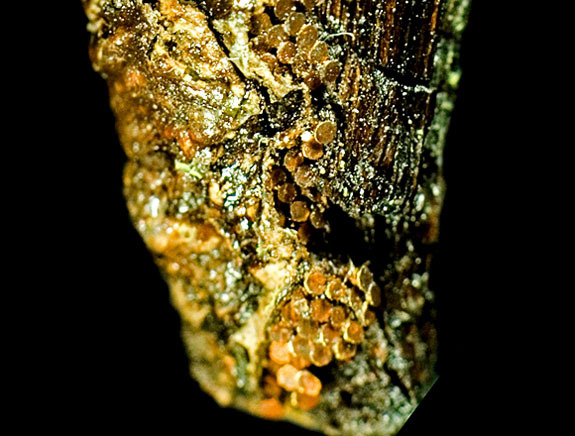 Back in February, we reported that Petra sold an “exceptional” acorn-sized 29.6-carat vivid blue rough diamond to luxury jeweler Cora International for $25.6 million. Only last month, Cora showed off the transformation of that rough diamond — sourced at Cullinan — into a 12-carat internally flawless cushion-cut masterpiece named “Blue Moon.” On Saturday, that stone will be headlining a 16-week exhibition at the Natural History Museum of Los Angeles County. 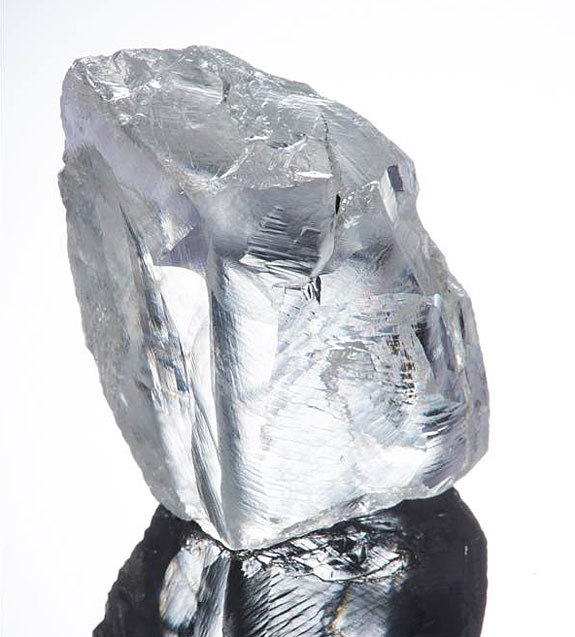 In mid-June, Petra unveiled a 122.52-carat blue rough diamond found at the Cullinan mine. 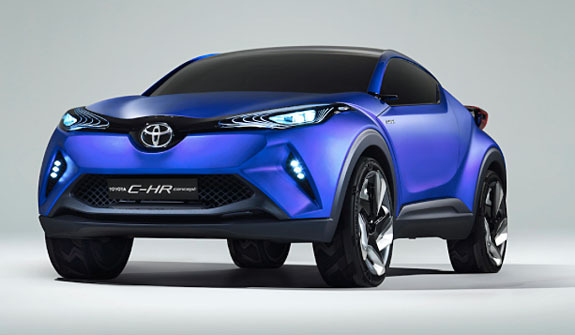 Analysts said at the time that it could sell for more than $35 million and set a new record. 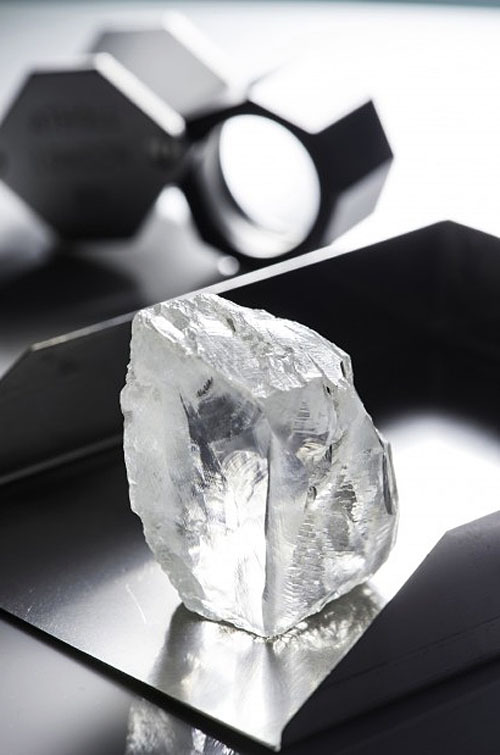 The recent spate of newsworthy diamonds coming from the Cullinan mine is hardly impressive when compared to the granddaddy of them all — the 3,106-carat Cullinan diamond, which was found in 1905 and eventually segmented into the stones that are part of the British Crown Jewels. These include the Great Star of Africa (Cullinan I) at 530.4 carats and the Second Star of Africa (Cullinan II) at 317.4 carats. Welcome to Music Friday when we bring your great songs with jewelry, gemstones or precious metals in the lyrics or title. In honor of September’s official birthstone, we present Stevie Nicks singing her 2001 release, “Bombay Sapphires,” an emotional ballad that shines the spotlight on precious gemstones, not the famous gin. “Bombay Sapphires” generated a bit of confusion when it was released as the 11th track on Nicks’ critically acclaimed Trouble in Shangri-La album. Was she referencing exotic blue gemstones or Bacardi’s popular premium gin? Nicks answered the question directly in a 2001 interview with In News Weekly. “Has the liquor company called to say ‘thank you’ and did they send over some product? No they haven’t. It’s not Bombay Sapphire. 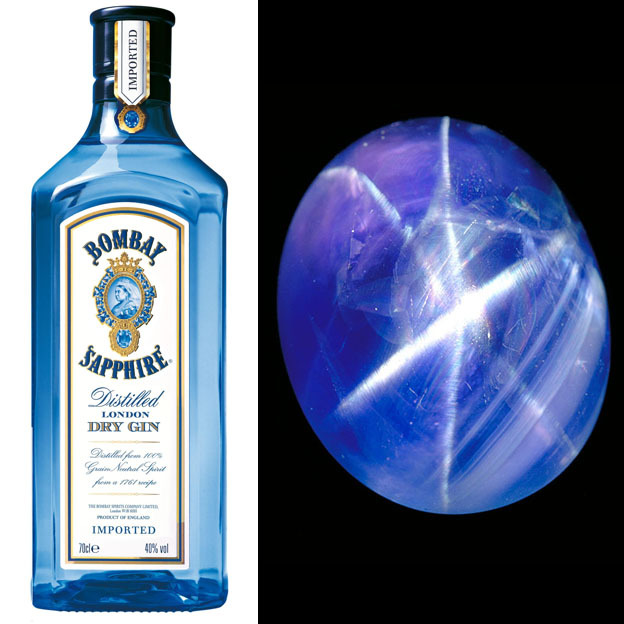 It’s Bombay Sapphires,” she said. Nicks further explained that she got the idea for the song many years prior to its release when she was chatting with friends about jewelry and gemstones, particularly rubies and Bombay sapphires. According to a Stevie Nicks fan site, the artist wrote “Bombay Sapphires” in 1999 while on vacation in Hawaii. She was apparently coming off an emotional breakup with on-again, off-again love interest Lindsey Buckingham and was ready to move on with her life. Nicks’ Trouble in Shangri-La album scored a Top 5 position on Billboard’s Top 200 albums chart. During her storied career as a soloist and with Fleetwood Mac, Nicks amassed more than 40 Top 50 hits and sold more than 140 million albums. She still tours regularly at the age of 66. 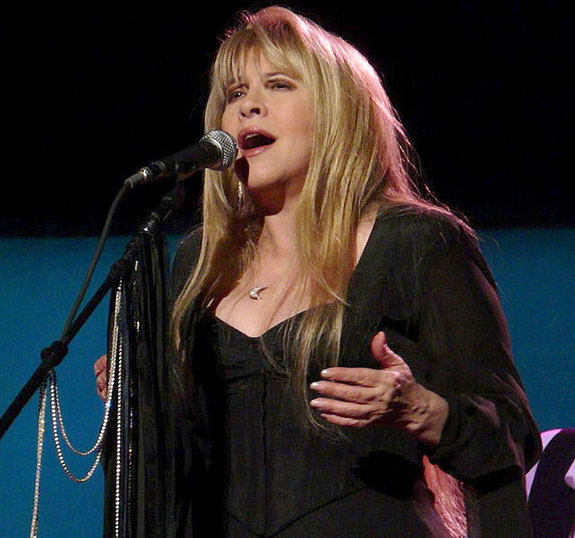 We invite you to check out the video of Stevie Nicks singing "Bombay Sapphires." The lyrics are below if you'd like to sing along. Can I go on without you? 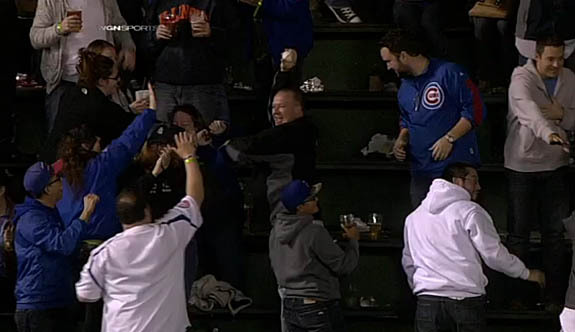 Baseball fan Michael Haberkorn was ecstatic after making a nifty barehanded catch on the home run ball of Chicago Cubs’ rookie sensation Jorge Soler in the seventh inning of Tuesday night’s game against the Cincinnati Reds at Wrigley Field. WGN-TV cameras caught Haberkorn’s priceless reaction as his jubilation instantly turned to utter despair. 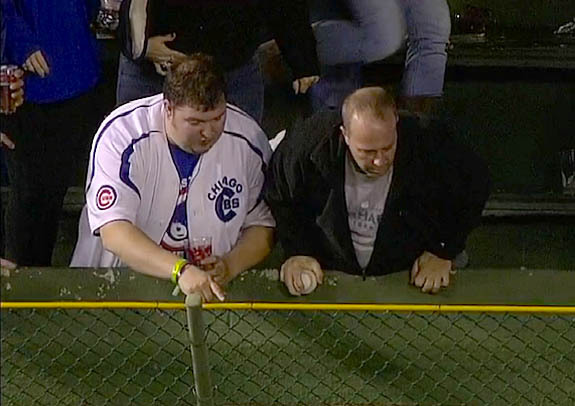 Fortunately, eagle-eyed fans sitting next to Haberkorn had followed the flight of the ring and were able to spot it on the warning track in left field. 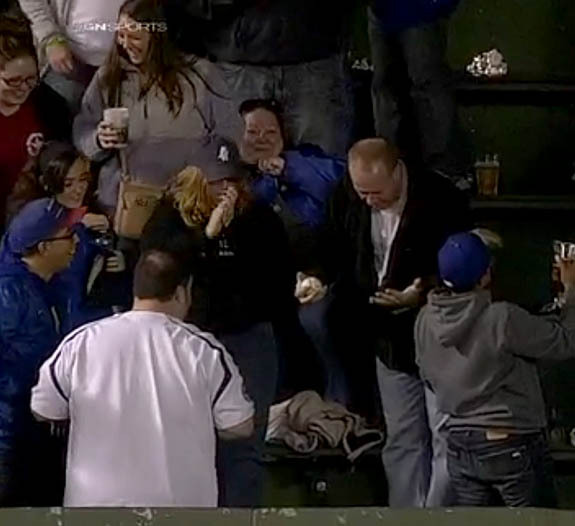 Haberkorn called over a Cubs’ usher and showed him where the ring had landed. 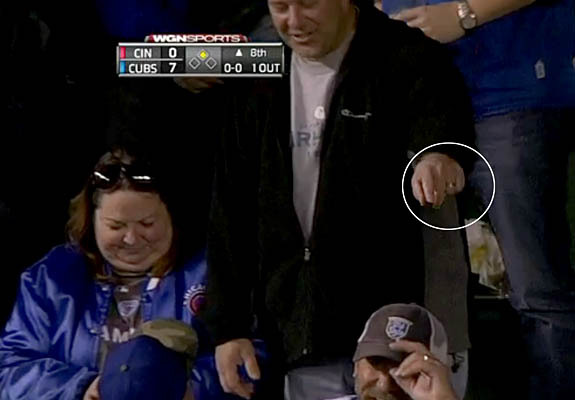 Within a few minutes, the ring had been recovered by the grounds crew and returned to its panicked owner. 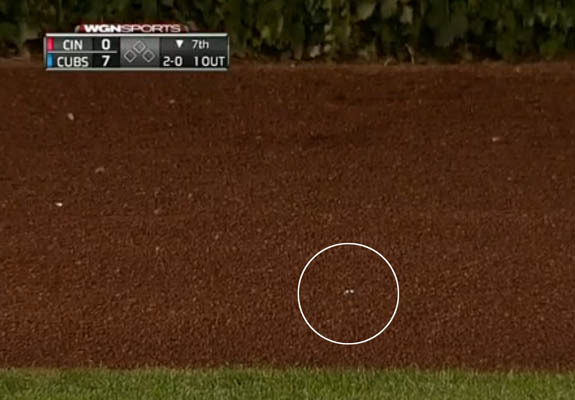 Fortunately, the ring didn’t get caught up in the dense ivy that covers the brick walls of the outfield. The announcers also told the television audience how Haberkorn needed to go out and get the loose-fitting ring resized. Haberkorn noted that the 22-year-old Soler had agreed to sign the baseball, which represents the first Wrigley Field homer by the impressive Cuban-born prospect. 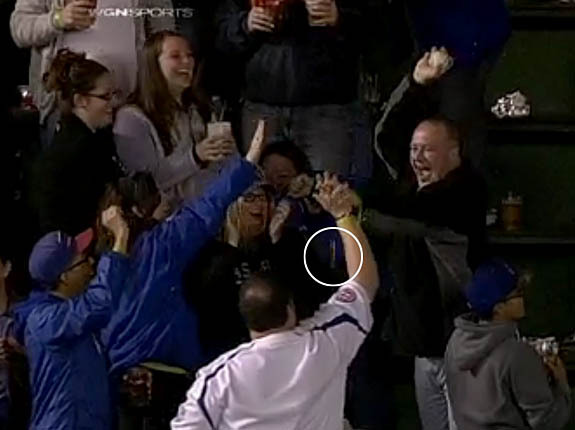 Check out the MLB.com video showing how Haberkorn lost his ring, where it landed and how he got it back. Click below. More than 12 million people tuned in last Wednesday to see Mat Franco take home the $1 million grand prize on NBC's America’s Got Talent. 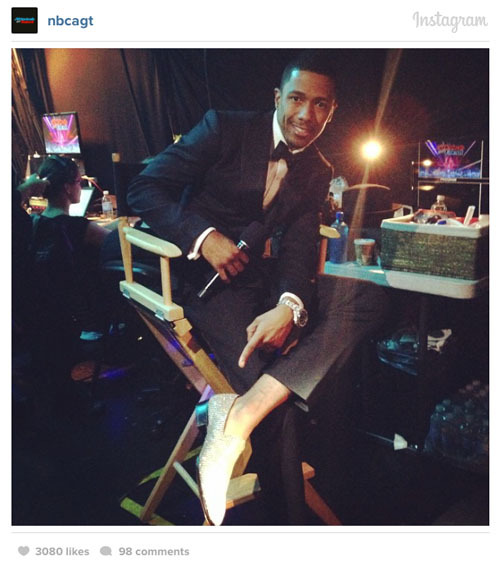 But what everyone was buzzing about after the show was not the talented magician, but host Nick Cannon’s diamond-encrusted shoes. 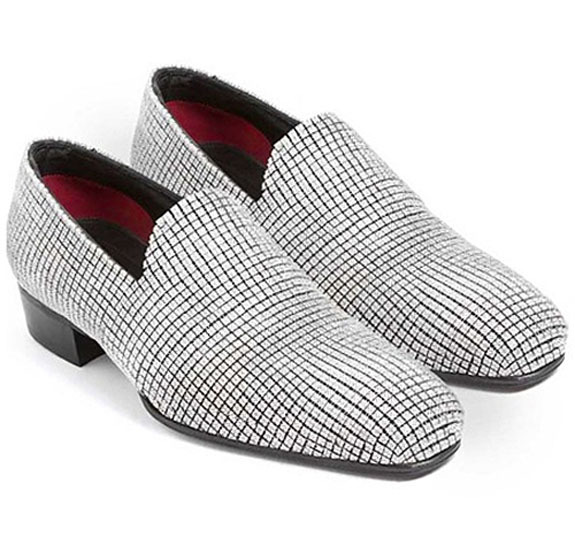 Valued at $2 million and dripping with 14,000 full-cut diamonds set in white gold, the slip-ons were ordered by Cannon nearly a year ago to deliver a “wow factor” to the season 9 finale. The Guinness Book of World Records is currently evaluating Cannon’s footwear for the title of the Most Valuable Pair of Shoes in the World. Beverly Hills jeweler Jason Arasheben told Matt Lauer of the Today Show that the shoes took 2,000 man-hours to create and feature 340 carats in diamonds. 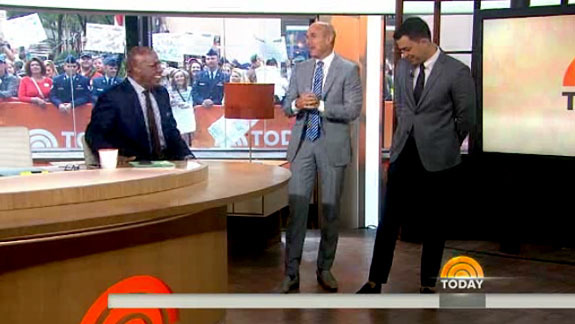 Lauer, who had the privilege of modeling the diamond loafers during the Thursday morning broadcast, joked that his calves were getting a workout. “They are heavy,” he said. Arasheben also revealed that his team experimented with various shoe brands until they found just the right match for this project — a flexible pair of patent leather Tom Fords. 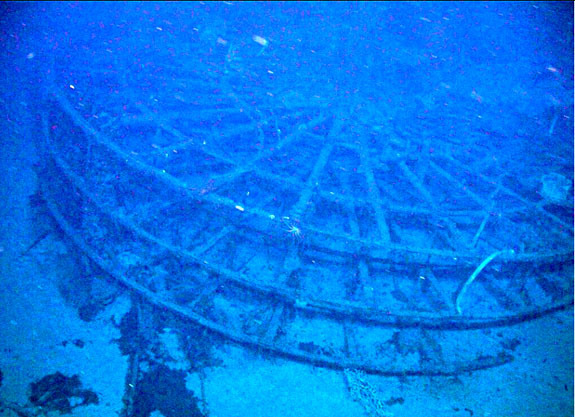 “We didn’t want [Cannon] looking like Frankenstein when he walked,” the jeweler said. It is rumored that Cannon is going to take the shoes on tour and then donate them to charity. The talented 33-year-old singer/actor/comedian and husband of diva Mariah Carey solicited recommendations of potential charities on his Twitter page. Franco became the first magician to win the America’s Got Talent competition. In addition to his seven-figure cash prize, he will also get to headline a show in Las Vegas. British scientists studying the gold-studded treasures unearthed at a 4,000-year-old Stonehenge burial site are convinced that children were responsible for the ultra-fine craftwork and likely developed debilitating myopia from their labor. 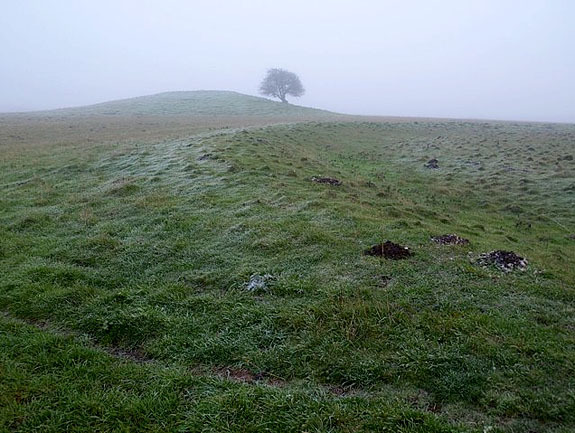 New research into the artifacts of Bush Barrow, a burial mound first discovered in 1808, delves into the human cost of micro-gold working during the Bronze Age. A BBC documentary, “Operation Stonehenge,” contends that children as young as 10 years of age were likely responsible for creating some of the most elaborate treasures of that era. The Bush Barrow dagger, for example, was originally decorated with a handle gleaming with a herringbone pattern of 140,000 tiny gold studs, each thinner than a human hair and barely 1mm wide. They were meticulously set — 1,000 per square centimeter — into the wood handle to create a layering effect reminiscent of fish scales. 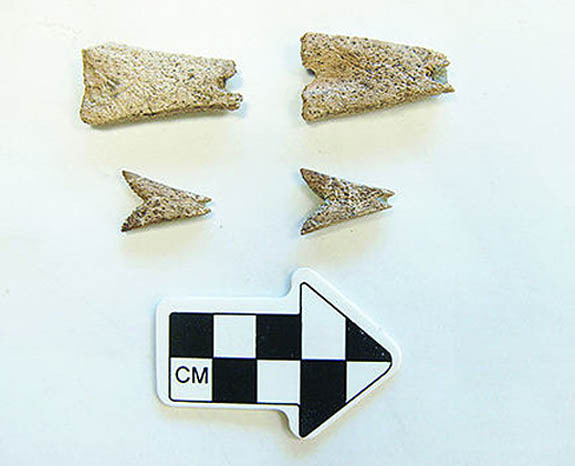 “The size of the studs clearly shows they are too small for adults to have made and set into the dagger handle,” David Dawson, director of the Wiltshire Museum, told Discovery News. 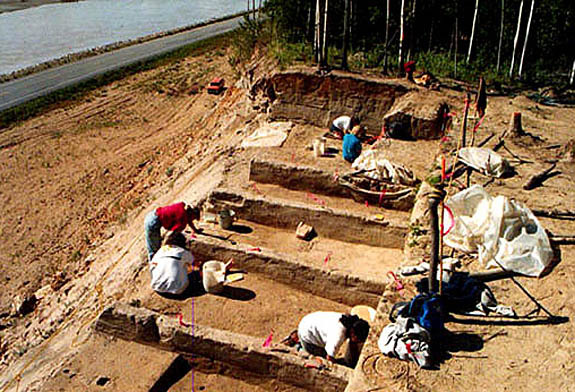 Dawson estimated the ornate dagger, which was found in the burial chamber of a clan chieftain along with his remains, would have taken at least 2,500 hours to complete. Worse yet, the task would have left the young artisan nearly blind because the close-up focusing was done without the assistance of a magnifying glass. That helpful device wouldn’t be invented for another 1,000 years. 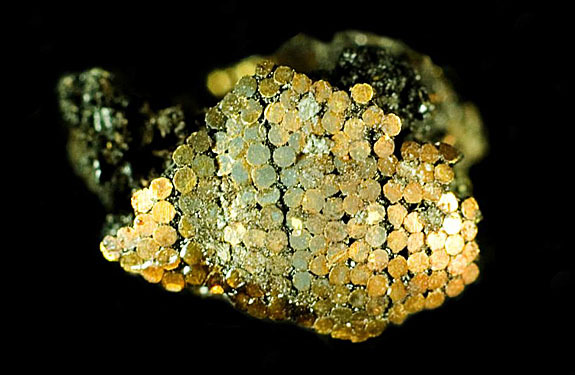 “Only children and teenagers, and those adults who had become myopic naturally or due to the nature of their work as children, would have been able to create and manufacture such tiny objects,” Ronald Rabbetts told Discovery News. 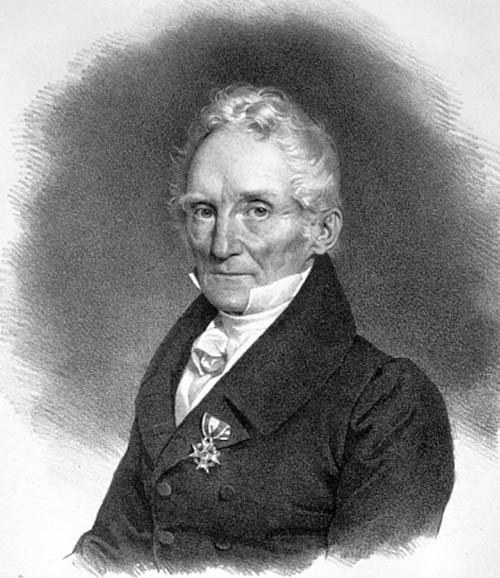 Rabbetts, who is one of Britain’s leading authorities on the optics of the human eye, said that within five years, the child workers’ eyes would have deteriorated, rendering the child very short-sighted. By the age of 20, many of them were likely almost blind, seeing anything more than three feet away as just a blur. 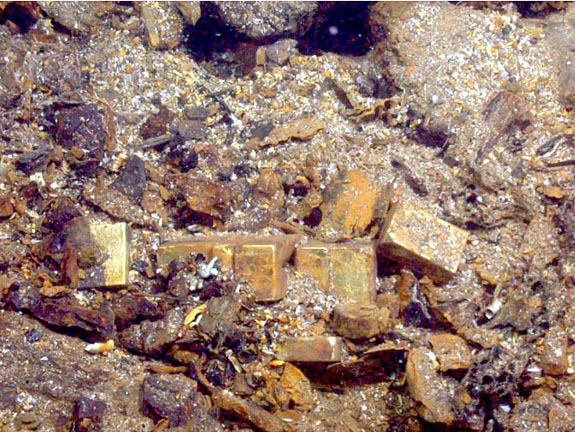 “They would therefore have been unable to do any other work apart from the making of tiny artifacts and would have had to be supported by the community at large,” Rabbetts said. Visitors to Stonehenge can see the Bush Barrow artifacts at the Wiltshire Museum in Devizes, just 15 miles from the famous prehistoric stone monument. 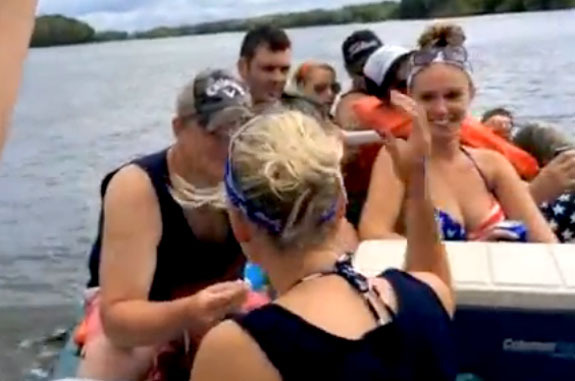 A romantic paddle boat ride on the Wisconsin River with a bunch of close friends seemed to be an ideal place for the dapper Shane to pop the question to his lovely girlfriend, Cheri. Well, it wasn’t. And the 42-second video chronicling a romantic marriage proposal that goes terribly wrong has been seen by 4.2 million YouTube viewers, and counting. 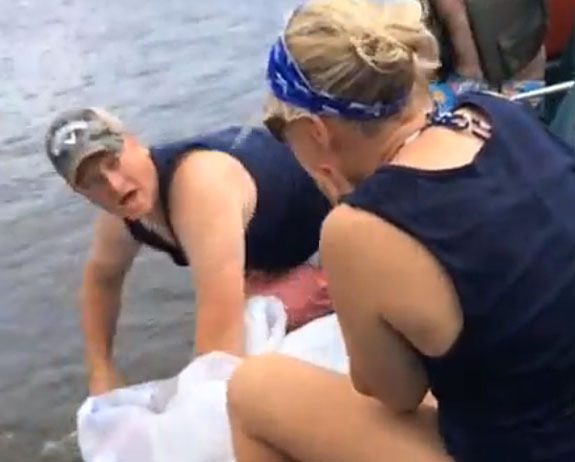 The first 15 seconds of the video seem fairly routine, as we see a paddleboat packed with about 10 people floating leisurely down the river near Muscoda, Wis. 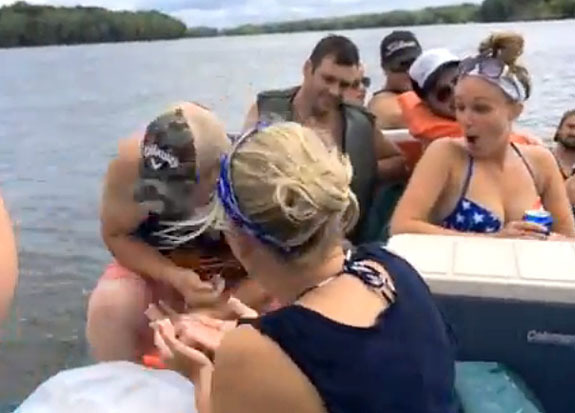 In her excitement, Cheri playfully taps Shane’s arm, jarring the ring from his grasp and sending it flying into the river. Then, he steps off the paddleboat and into the knee-deep water to start the search. 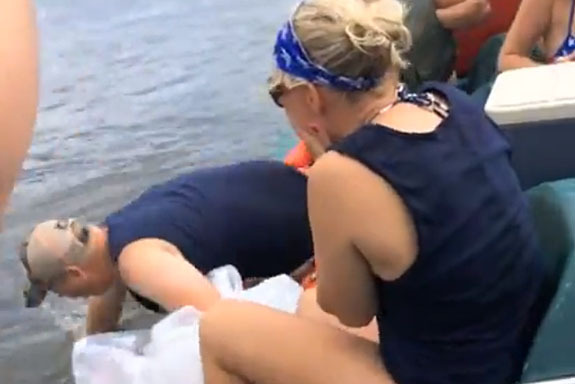 Cheri remains on the boat with her hands pressed to her mouth, sobbing. 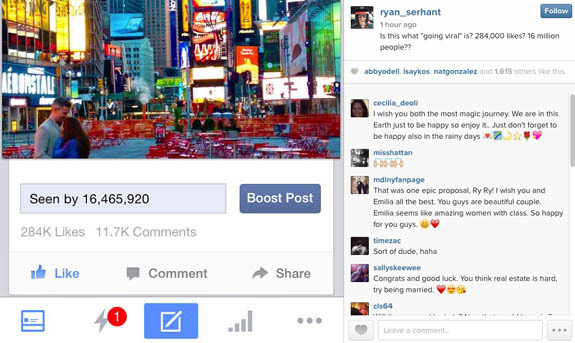 A few days ago, a friend of the couple, Elias Eitsert, came forward with more info. 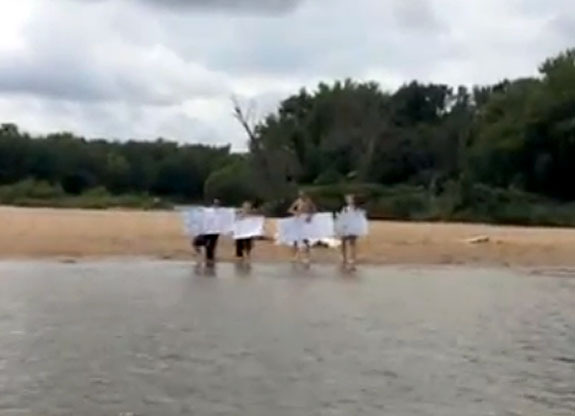 He told The Daily News that the group searched the river for two days but were unable to find the ring. He also reported that the couple is happily engaged despite the ring being at the bottom of the river. There is also a good possibility that the viral nature of the video is generating revenue for the couple as a result of YouTube's Partnership Program. Viral videos that stand the test of time can earn thousands of dollars a month for their creators. Perhaps Shane and Cheri will put some of the proceeds toward a new engagement ring. Welcome to Music Friday when we bring you the latest tunes with jewelry, gemstones or precious metals in the lyrics or title. Today’s featured artist is 23-year-old Grammy nominee Ed Sheeran singing his brand new release, “Photograph,” from his chart-topping album, Multiply. Co-penned by Sheeran and Snow Patrol guitarist Johnny McDaid, the song examines the pain of love when you're separated from your sweetheart and focuses on how the memory of a cherished love can be frozen into a photograph. Sheeran told Spotify.com that he and McDaid wrote “Photograph” in 2012 while hanging out in a Kansas hotel after a performance. Sheeran recalled how he was sitting on the floor making a Lego X-Wing Fighter to give to his sister for a charity auction while a piano loop kept playing on McDaid's laptop in the background. “I start singing a line and the song kind of unraveled from there,” Sheeran said. “We sat for about four hours, me making [the] Lego [plane], and him on the laptop, just building stuff and then I picked up a guitar and we properly structured it." Sheeran told The Daily Telegraph that “Photograph” was his “collateral” song from the new album, meaning that, if all else failed, “Photograph” could stand on its own. Well, the album didn’t fail. Multiply (stylized as “x”) went straight to #1 on the U.S. Billboard 200 album chart and was a blockbuster success worldwide. It hit #1 in 12 countries and reached the Top 5 in 11 others. Born in Hebden Bridge, England, Sheeran moved to London at the age of 17 to pursue a musical career. Three years later, his talent caught the attention of Elton John and Jamie Fox, and soon after he was signed by Asylum Records. His breakthrough song, “The A Team,” was nominated for Song of the Year at the 2013 Grammy Awards. Sheeran and John performed the song as a duet during the ceremony. A year later, he was nominated as Best New Artist at the 2014 Grammy Awards. 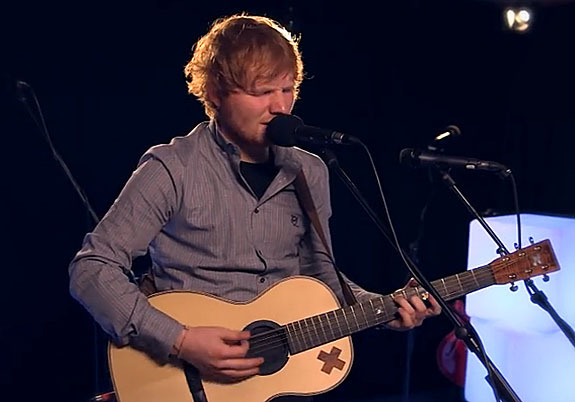 We welcome you to check out the video of Sheeran’s acoustic version of “Photograph,” which he performed at the Capital FM live studio. The lyrics are below if you’d like to sing along. Written by Ed Sheeran and Johnny McDaid. Performed by Ed Sheeran.